I thought I would use this week to try a different medium to share my ideas. Adobe Spark is an awesome way to share your story. I would love your comments about my blog for Week 2 and would challenge you to think about how you could suggest teachers use Spark. Feel free to share those uses in the comments as well. My job as a technology integration specialist is to push teachers and students to change. I try to “preach” that this change is necessary and good for all involved: teachers, students, parents, heck, society as a whole. Change comes easy for some, for others….ummmm…yeah, not so much! I do think that is it imperative that I practice what I preach when it comes to innovation. George Couros has challenged us this week with this question. “Change is an opportunity to do something amazing.” How are you embracing change to spur innovation in your own context? The district leadership team came up with a list of seven principles that will help guide our six schools as we implement innovative teaching practices. These seven principles have been dubbed 709 Above the Line. Above the line referring to the upper rungs of the SAMR model that we have used to help guide guide teachers as they implemented 1:1 iPads into their classrooms. This phrase will hopefully permeate the district as a whole as we move forward. We have started using #709abovetheline when we post to Twitter or Facebook. Student Engagement: Students are engaged when they have an active commitment to challenge themselves by demonstrating ownership of their learning. Collaboration: Collaboration is a dynamic process whereby members (students) can have a respectful and authentic analysis of ideas toward a shared educational goal, which involves critical thinking and problem solving. Innovation: Innovation occurs when a teacher gives students the freedom to use their intellectual creativity to solve a problem, answer a question or determine a NEW WAY to accomplish something. Quality of Creation: Quality of creation is evident when the product demonstrates higher level thinking skills were used to show mastery of a skill or concept. Meaningful Outcomes: A product should show a student’s creativity or ingenuity while also displaying a depth of understanding of the content. Problem-Solving: Problem-solving should show complex, creative, logical thought by students to solve a new, authentic problem. Higher-Order Questioning: Higher-order questioning should require a complex response requiring students to analyze, apply, predict or synthesize information in such a way that it prompts additional conversation by the class. I have been tasked with developing multiple professional development opportunities for each of the seven, giving me an outlet to practice what I preach. Feeling strongly that most professional development that has been offered to teachers has not been effective because it was given in sit and get sessions with the whole district in one place at the same time, my goal is to offer opportunities that teachers can pick and choose based upon their comfort level, and most importantly, their interest level. While a challenging task, developing these PD options has provided me a way to do what I am asking classrooms teacher to do…innovate! I am currently in the process of creating panel discussions with volunteer teachers to share what/why/how they are providing “above the line” experiences in their classrooms. These discussions will be provided through Google Hangouts On-Air (now YouTube Live)**. This allows for teachers to watch the event live, or because it is automatically posted to Youtube, whenever they can find the time. The hope is that teachers in our district will have more interest in hearing about the innovative practices their colleagues are using in the classroom than they might from an “outsider.” I have gotten a great response from teachers who are willing to share their classrooms with others…my job is to connect them with teachers who are willing to listen and hopefully take a chance on trying something new and innovative with their students. **- This is a resource that you need to try! I did it a few times before IMMOOC, but I am loving seeing other ways of using it! Balancing age appropriateness with innovation?? I need to start by mentioning that my entire classroom teaching experience was at the high school level. When I left the classroom, I became a technology integration specialist in the same district in which I had taught for 22 years; I was a known commodity! At first I was working primarily with the high school and junior high, but now I work with all levels EC-12. Ok…let me get to the point! I have worked really hard to gain an understanding of what it is like to teach at the lower grade levels. I follow just as many elementary teachers as upper level teachers on Twitter, read more books about that age level, and spend just as much time in elementary classrooms as high school and junior high. There is no question that to have a true understanding of the elementary classroom one needs to have taught at that level, but I am trying to understand. Side note…one thing that I have learned is that I think I would have been a good 4th/5th grade teacher…I love those kids! I think/hope that I am gaining the respect of teachers from all grade levels and they see me as someone who is willing to help them plan and implement innovative ideas into their classroom. When teachers and/or principals have a “beef” with me, I tend to hear concerns about whether what I am suggesting or pushing for is “age appropriate.” Self reflection is one of my strengths so this concern does keep me up at night! Obviously I understand the term (I have two grown children), but when does that concept get in the way of innovation? That keeps me up at night more than the fact that someone might disagree with me! If we think that it is age appropriate for young children to read a “real” book because they have to feel the pages, does that not negate some of the innovation that might come from introducing e-books? If we say that children must handwrite on paper because it is age appropriate, does that not limit what a teacher is willing to introduce into his or her classroom? I could provide other examples, but I truly think about this idea a lot! If we always say something isn’t age appropriate will things ever change? Am I the only one who struggles with this idea? Seriously, how do you balance the two?? I would love to hear your thoughts! This will be the third time reading The Innovator’s Mindset, but I am really looking forward to this new experience of a MOOC. I am currently in a book study with the leadership team in my district, so it will be interesting to see the differences between these two very different ways of exploring the book. I am hopeful that the MOOC experience of having access to so many people (1200+) will allow me to add to the in person discussions that we have about our district. It is also my hope that I will have many new ideas added to my toolbox that I can use in my role as a technology integration specialist. So, the questions for this initial blog… Why is “innovation” so crucial in education? What impact do you see it having on our students and ourselves long-term? I think that innovation is the way that schools will stay relevant in the lives of students. Being able to come up with new and improved ways of doing things will prove that education is not a passive profession. We cannot be passive! The world has changed from when I was in school in the ’70s and ’80s, but schools still outwardly function the same way. I say outwardly because there are still bells, grades, rows of chairs, etc. present in most schools. Don’t get me wrong, there are those educators and schools who have encouraged innovation and are seeing the benefits in the general level of engagement of students. Innovation is the lifeblood and future of our schools. While that sounds melodramatic, think about a discussion about innovation within a profession like medicine. A surgeon saying that he/she used to successfully perform heart surgery a certain way in the ’80s so it should be good enough for today sounds absolutely ridiculous. We would never send a loved one to that doctor, but we think that educating students in ways of the past is okay! It truly does sadden me to think of a day when public education is completely irrelevant to what students choose to do later in life. I am hoping that this experience is a two-way street of others sparking my thought process as well as me providing food for thought for others! Naming a blog is hard work! Maybe not naming a child hard, but still challenging none the less. How can I capture what I might want to write about weeks, months, and hopefully years from now?? I think what I have chosen is fitting. 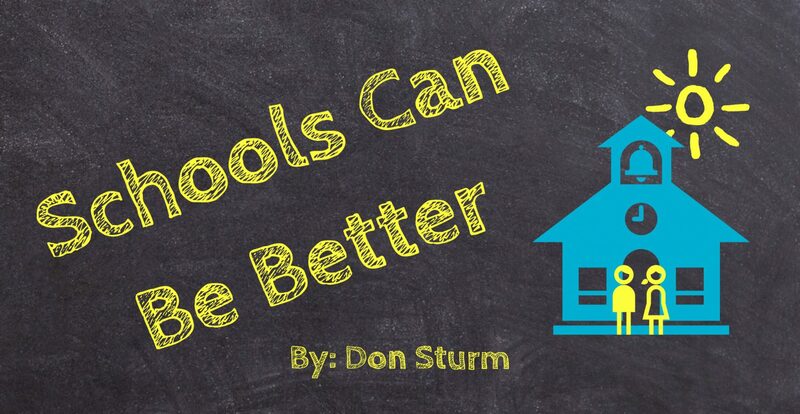 School has been a part of my life in some way for the last 42 years and, as the title of my blog clearly states, I think that schools can be better. We are living in a time when we have to give strong thought to how schools serve students. It is no longer okay to teach kids the way that we were taught. It is not fair to students, nor society as a whole! Even though the district that has been my home for the the last 23 years is a high performing district that has high expectations for its teachers and students, there is still room for improvement. Not striving for something better will lead to stagnation and stagnation is not good for students. I should make it clear that this blog is in no way affiliated with Morton CUSD #709. My opinions are my opinions. In fact, there might be times that what I choose to write would not necessarily be supported by “my” district.